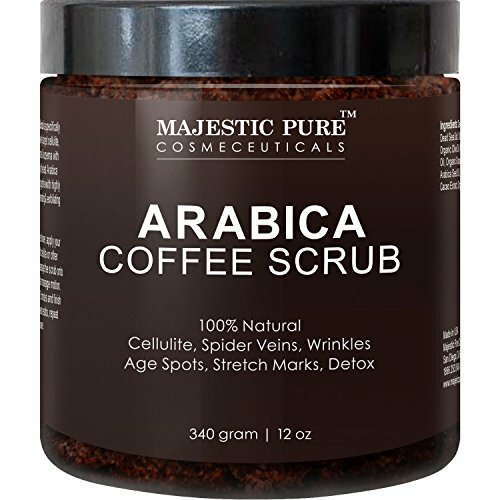 Majestic Pure Arabica Coffee Scrub (12 oz in weight / 8.8 fl oz in Volume) is 100% natural and specifically formulated to actively target cellulite, stretch marks, acne & eczema with caffeine from only the best Arabica beans; blended together with highly moisturizing, regenerating & exfoliating oils & salts & brown sugar. Caffeine present in the scrub stimulates blood flow and helps reduce the appearance of cellulite, eczema, stretch marks, age spots, varicose veins and psoriasis. Dead Sea Salt is an excellent skin detox helping in reducing dead skin, acne, whiteheads, blackheads, breakouts and other skin blemishes. Coconut oil hydrates and moisturizes the skin; shea butter and cocoa butter are high in antioxidants which nourish and protect the skin, promoting cell repair and rejuvenation. Majestic Pure Arabica Coffee Scrub is manufactures in a GMP US lab. Click the button at the top of this page to buy with confidence.• Majestic Pure Arabica Coffee Scrub is 100% natural and specifically formulated for cellulite, stretch marks, spider veins, acne, age spots & eczema with caffeine from only the best Arabica beans; blended together with highly moisturizing, regenerating & exfoliating oils & salts. Manufactured in USA in GMP lab; 12 oz in weight (8.8 fl oz in Volume). Caffeine present in the scrub stimulates blood flow and helps reduce the appearance of cellulite, eczema, stretch marks, age spots, varicose veins and psoriasis. Dead Sea Salt is an excellent skin detox helping in reducing dead skin, acne, whiteheads, blackheads, breakouts and other skin blemishes. Coconut oil hydrates and moisturizes the skin; shea butter and cocoa butter are high in antioxidants which nourish and protect the skin, promoting cell repair and rejuvenation. Purchase with complete peace of mind, we are confident we have developed the absolute best scrub formula. If you are not completely satisfied with Majestic Pure Powerful Arabica Coffee Scrub, we will refund your entire purchase.